I attended Florida State University, majoring in fine arts, and opened my first jewelry store on College Avenue with three partners. In 1976 we moved the store to Washington, DC, in the heart of Georgetown, and changed it's name to Decorus Custom Goldsmiths. 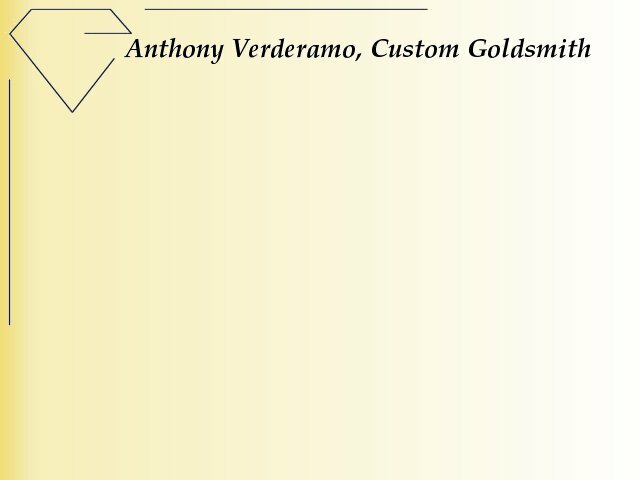 In 1980, I opened my own shop, Anthony Verderamo Goldsmith, at Wisconsin & P Streets, also in Georgetown. For the next 16 years, I created jewelry for many dignitaries, ambassadors and sports figures such as Dr. Margaret Meade, Dr. Armand Hammer, Queen Noor of Jordan, the Georgetown Basketball Team, Sugar Ray Leonard and many more. In 1998 I moved my family and business to Naples, Florida and opened my current store in the tourist district of Naples, specializing in creating one-of-a-kind, hand-crafted custom jewelry.